Right around this time last year, we spent several weeks reading Little House on the Prairie books together. Now my daughter and I are revisiting the late 1800's with a new beginning reader chapter book series, Circle C Beginnings. Goodbye prairie -- howdy Wild West! The recently released Circle C Beginnings series tells the fictional story of a little girl named Andi who lives on a ranch in California in the 1870's. Andi is nearly six years old, a bit of a troublemaker and tomboy, and she wears overalls on the ranch instead of dresses. Her headstrong ways lead her into all sorts of problematic situations. In Andi's Pony Trouble, the first book in the series, Andi desperately wants her very own horse. She's all set to celebrate her sixth birthday and she's tired of riding Coco, the family's "old, slow, worn-out pony." Her mother tells her she's not ready for to care for a horse of her own and remarks that Andi needs to take better care of Coco. Feeling sorry for herself, Andi goes about her day and nothing goes her way. She breaks the eggs when the mean rooster chases her. 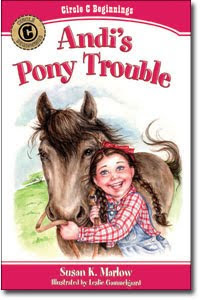 When a horse ride in the meadow with her friend Riley goes awry, Andi begins to appreciate Coco and learns a valuable lesson. Although Andi is overly whiny and gloomy (hmm...sounds familiar) in the beginning part of the book, she experiences a change of heart at the end. My daughter liked learning about the jobs involved in taking care of a horse. The book includes several horse-related terms like lope ("faster than a trot but slower than a gallop). 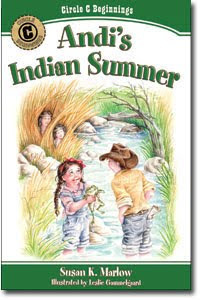 Andi and her friend Riley encounter members of the Yokut tribe in the second book of the series, Andi's Indian Summer. They lose their way while riding their horses on the ranch and meet two young Yokut children. At first Andi is frightened when she first meets the tribe members. Her perspective is tainted by a scary dime story novel she read earlier with Riley. Andi and Riley end up staying the night with the Yokut Indians and learn about their culture. Andi's Indian Summer deals with stereotypes and provides a nice starting point for discussing inaccurate portrayals of Native Americans. Marlow even includes a short, informative author's note called "A Peek into the Past" at the end of the story. After reading the book, kids might want to learn more about the Yokut Indians. However, since the book is meant for young children, I think it would have also been helpful if Marlow would have, in her author's note, explained how she used the word "Indian" in context to the historical setting of the book. "Honestly, I’m amazed that nobody has brought this up. It brushed the back of my mind, for sure. But I had to keep Andi in overalls, because the series is a spin-off from the older kids’ books [the Circle C Adventures series for ages 9-14], where Andi is 12 and yes, she wears her brothers’ old overalls. The attire out West was pretty varied. True, I did take some literary license for the Circle C Adventures, because a rich rancher’s kid would not likely be allowed to get away with wearing boys’ clothes. However, I balanced it by restricting the attire to the ranch only. And I made a point of it in the first book, Long Ride Home." The Circle C Beginnings Series is an interesting and fun beginning chapter book series for young children (ages 6-8), especially those who enjoy reading about life the late 1800s. The books also won't break your budget at only $4.99 each. The series is ever so slightly religious as both books briefly mention God and prayer. I really like that kids can grow with Andi and the series and transition into the Circle C Adventure series after they finish the beginning reader Circle C Beginnings books. My daughter was pleasantly surprised at how many words she was able to read in the books, and I'm sure that within the next year she'll be able to read them to herself. She enjoyed all of Andi's adventures and has decided that she wants a horse of her own, too. I'm afraid she'll have to be content with the little play horse set that Santa brought for now. The third and fourth books in the series, Andi's Fair Surprise and Andi's Scary School Days are set to release soon in March 2011. The Circle C Beginnings website contains information on all the books. The website also offers several coloring pages and wonderful educational activity packs that correspond with each book title. Author Susan Marlow has graciously offered to give away a set of the first two books in the Circle C Beginnings Series to a Brimful Curiosities reader. To enter this contest, leave a comment relevant to this post. Do you or your kids like horse themed books or historical fiction? • Contest ends on Monday, February 14th, 2011 at 11:59 PM CST. These books sound great, and they are even set in our State :) I don't care much about horses, but Anna adored Little House and she generally likes to read historic fiction. I have a lovely little niece who loves horses who would love this. These are such cute books! I signed up to follow. My daughter loves horses, and I love historical fiction. My oldest daughter enjoys reading historical fiction. She has read these novels alone and with me. She learns a lot from these books. We would love to win these two books! We follow you! We get emails of your blog postings. My youngest daughter is interested in horses and likes to read. I think she'd enjoy these books. Thanks. My granddaughter likes horses and historical fiction, so she would like this book! My grandson love books about Horses! I am an email subscriber and google follower! Winnie the Pooh - A.A. Milne's Birthday!